It’s as true today as it was in the early ‘80s—there’s nothing quite like the exquisite tension of exploring a creepy, creature- and trap-filled dungeon, square-by-square, in first-person. Operencia: The Stolen Sun, Zen Studios’ modern take on the classic dungeon crawler, is sleek, challenging, and incredibly charming. Players have been advancing through fantasy dungeons one map space at a time since the earliest days of PC gaming. 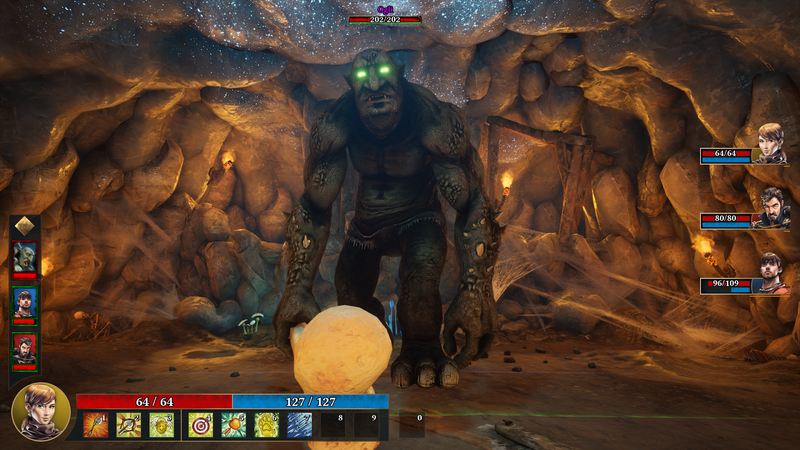 First-person dungeon crawlers like 1981’s Wizardry: Proving Grounds of the Mad Overlord drew players in with their primitive yet effective first-person views. Not knowing what lurks around the corner is a tried and true method for building suspense. Operencia: The Stolen Sun, out now for Xbox One and PC via the Epic Game Store, makes excellent use of its perspective, combining the spell-casting, sword-swinging action of the genre’s greats with modern visuals and a healthy dose of character. Character is a primary focus in Operencia. Whereas players in other modern day dungeon crawlers, like Atlus’ long-running Etrian Odyssey series, are tasked with creating every party member, Operencia’s adventure begins with a single character. She or he, a warrior, wizard, or hunter, is the youngest child of a humble farmer, setting off on a grand adventure. The sun king, Napkirály, has disappeared, and our hero must travel a land inspired by Central European mythology, gathering a band of memorable characters to help restore the light. The rest of the player’s party is made up of prefabricated characters who join as the adventure progresses. Characters like Jóska, the sly rogue whose sardonic dialogue makes any encounter more enjoyable. Or Mezey, the naive knight with a tendency to take Jóska’s wordplay literally, to humorous effect. Each new addition to the party adds a new layer of pleasing complexity to the game narrative. The fully-voiced party talks among themselves as they delve into Operencia’s expansive environments. Should the heroes come across a new creature, they’ll discuss it during battle. During one of the game’s puzzle sequences, party members will give subtle hints on how to solve them, urging the player on as they close in on a solution. They’re real pals, even when they’re threatening to kill each other. Friendship is complicated. The game’s turn-based battles are exhilarating. When enemies are encountered in a dungeon, the game shifts to a battle view. Here creatures line up three rows deep for a chance to kill our heroes. Each character has an ever-growing repertoire of flashy skills, spells, and abilities for causing damage or buffing and healing comrades. Early battles can drag, as the player gets used to what each character can do. Five hours into the adventure, I am just now feeling like I am hitting my stride, and that’s playing at the lower of the game’s two difficulty levels. Exploring the world of Operencia is a joy. Basic grid-based, one-square-at-a-time movement coupled with a free camera gives movement a more fluid feel than more traditional dungeon crawlers. At times it almost feels like free-roaming. It’s silky, while still maintaining the step-by-step structure that characterizes the genre. Operencia is a beautiful place. There are dark caves glowing with phosphorescent fungus. Tangled woods enchant as their spidery denizens terrify. The game’s first proper dungeon is a sunken castle, where water hangs oppressively overhead. Some areas of the castle are flooded, and I found myself holding my breath while passing through. It’s that sort of tension I look for in a first-person dungeon crawler. Operencia: The Stolen Sun has it, and so much more. Its character, wit, charm and beauty make wandering its fantasy landscapes a real pleasure.